World government is officially here. With the click of a gavel, Obama became "the first American president to preside over a Security Council summit" thus marking the moment when America officially abandoned its sovereignty, prostrating itself to a world body representing every freedom hating tin-pot dictatorship in the world. The details of this meeting are not relevant. The fact that an American president now overtly sanctions the legitimacy of this body and subordinates American interests to its policies, in principle, means that the United States government has ceded its Constitutional authority to a global governmental organization. The loss of American sovereignty is a direct result of the modern philosophical assault on objectivity. Obama seeks to operate under the auspices of organizations like the United Nations because he rejects the idea that America has any objective moral authority in the world. This is because Obama rejects the idea of objective morality. He would ask: "who is the United States to tell other countries what to do?" Asserting America's interests requires a commitment to the principle that freedom and individual rights are objectively better than slavery and dictatorship. To the moral relativist, no culture is superior to any other. Mr Obama proclaimed a sharp break with the previous US administration, acknowledging perceived American unilateralism had fed skepticism and distrust of his country. What's ironic about that statement is that "trust" depends on one's willingness to commit to a plan of action. If one is principled, it becomes perfectly obvious how they will react to any situation. For example, if a country holds firm to a policy of not negotiating with terrorists, then any would-be terrorist knows their tactics are futile. In other words, an approach in which one is willing to act on principle despite the objections of others or regardless of its perceived popularity could not result in "skepticism" or "distrust." Such an approach results in certainty in the minds of your allies and enemies. Only an unprincipled, pragmatic approach based on the pursuit of short run objectives that may or may not conflict with longer term goals could cause capricious, contradictory policies. Only this approach could feed skepticism and distrust. The nations of the world recognize that Obama is one of them. Not only does he agree that America should feel guilty for its successes, but it should actively work to level the playing field by sacrificing itself. Publicly, other nations welcome Obama's cosmopolitan attitude, but privately they know they can exploit his weaknesses. as Obama left the Security Council chamber, he told the Associated Press: "It was an excellent day." I can objectively and confidently say on behalf of anyone who seeks to subjugate individual rights and excise the last vestiges of spirit from those who look to the United States as a beacon of moral certitude and a symbol of freedom - it certainly was. It's interesting to note that not only did the Canadian Prime Minister not attend the opening of the UN, choosing instead to welcome a corporate headquarters back to Canada, but the Canadian delegation in attendance also walked out in protest before Iran's dictator spoke. Are Canada and the US trading international political positions? In short, I say no. I would liken Canada's boycott to donating to a church, going to church, but then closing your ears for 40 seconds during the most objectionable part of the sermon. The most essential point is that you went to church. The U.S. and half the other countries walked out or did not attend A-Jad's speech as well so I don't think it means much. The most important point is that they explicitly sanction a body that allows dictators like A-Jad and Ghaddafi to be members. This grants legitimacy to these regimes and subjects our nations to the dictates and votes of maniacs. Of course, this approach is entirely consistent with moral relativism emanating from the rejection of objectivity. 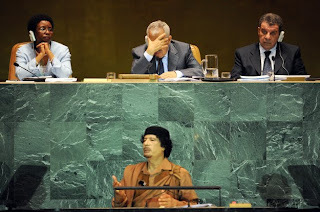 "If you look at President Obama's speech today and focus more on that than Mr. Gadhafi's speech," the day was a resounding success, he said. "(Obama's) call to action where everyone should renew, as he said, the United Nations and get back on track – that in itself was a very strong, positive message." In other words, he explicitly supports the mission of the U.N. which is far more important problem. As far as the UN goes, from one who has had the distinct displeasure of being under its command and control I see the PM's absence as less than tacit approval for that body. Politically all his ministers will mouth the words of support of course, but Harper is pushing the envelope a bit here. Canadians by in large believe in the UN, hell a Canadian is responsible for the disaster that is "peacekeeping" but this current government continues to move us by millimetres if not inches away from that failed ideal and off onto our own path, and that is a good thing. Your wake up call is set for 2025. Doug, would you agree that the US has been mislead by any number of past presidents? By that I mean, just how many times has someone lead American away from the founder's idea of what the country should be? FDR dropped support for the American bill of rights back in the 1930's with his endorsement of the UN package. I agree with you that Mr Obama has the most blatant Anti-American group of advisers since the inception of the USA and can honestly be classed as the most anti-American president to date. His presidency graphically show how important the intellectual climate of the day is to the direction the country will go. Successful community organizers make poor choices for president. My reason for saying this - American's strength is the individual citizen, not the president and we should not get discourage, just angry. "The concept of a peaceful community of nations had been outlined as far back as 1795, when Immanuel Kant’s Perpetual Peace: A Philosophical Sketch outlined the idea of a league of nations that would control conflict and promote peace between states. There, Kant argues for establishment of a peaceful world community not in a sense that there be a global government but in the hope that each state would declare itself as a free state that respects its citizens and welcomes foreign visitors as fellow rational beings"
In other words, America's loss of sovereignty has been on a downward slide for a long time. Even Bush felt the need to argue his case in the UN and he was absolutely lampooned for being an evil "unilateralist" (btw, the left's latest anti-concept). Obama has accelerated this and is taking it to its ultimate logical conclusion. Of course, as I argued, I think as the case for moral objectivity declines, so does the concept of sovereignty. Any multiculturalist could not assert its nations objective self interest. To him, there is no such thing so he must seek consensus and compromise. Today's view of "sovereignty" mirrors the false alternative of dogmatism vs subjectivism. In other words, the dogmatist is the theocratic dictatorship that asserts its sovereignty on the basis of decrees from God and the subjectivists are the Western countries who reject sovereignty and grovel at the UN for sanctions and group consensus. Is "Time" Really "The Enemy of Reform"?